I took the kids to Foodland yesterday to find a pumpkin to carve and despite my own advice to my Allakhazam co-workers, I picked out a disgustingly large pumpkin. I don’t know if it was because it looked smaller in the store or if I just wanted to pick anything so that the kids would stop screeching, “MOMMY HOW ABOUT THIS ONE?! ?” at every pumpkin they saw. Whatever it was, once I brought it home I realized what a dumbass I am. I’m going to be scraping that puppy out for two or three nights! 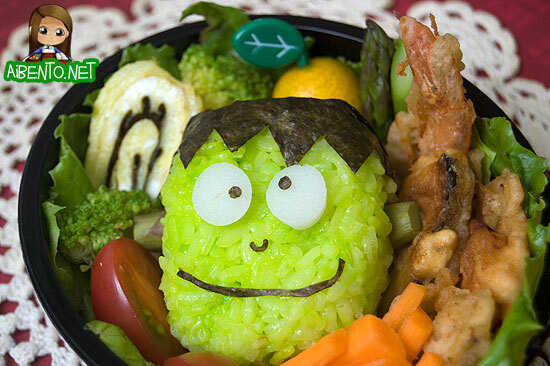 Next up in my Halloween bento frenzy is a Frankenstein Onigiri bento. He was a lot easier to make than I thought, but the entire ordeal took pretty long since I had to cook the egg and I had no plan. If you’re new to bento and wanting to know what my best tip for making a cute bento quickly, it’s definitely: Have a plan. You’d be surprised how much time it takes for you to stare into the fridge and try to figure out what to fill the lunch with. I started by lining the box with lettuce. It’s romaine, which is terrible for bento lining because it’s got a thick spine that you end up wasting and the leaves aren’t very frilly. Green leaf and red leaf are by far the best choices for lettuce lining. Next I took a big scoop of hot rice and added neon green food coloring diluted with drops of water. I mixed the color in with chopsticks and ended up using a total of 4 drops of coloring. When the onigiri was formed, there were a few kernels of rice that were still white, so I dabbed some leftover color from the spoon I’d mixed it in and dabbed it on with my finger. I cut his mouth and hair freehand with a scissors and used a smiling eye from one of my nori punches for his nose. His eyes are made of kamaboko cut with a very thick straw and nori eyes punched with a 1/8″ single hole puncher. On the side of his head, I have pieces of asparagus poked in for his screws. Going clockwise from the nori tamagoyaki there is: broccoli, a kumquat from my tree, asparagus, shrimp and kabocha tempura, baby carrot sticks, baby roma tomato, and more broccoli. I have to go back to the egg though. Last week I bought a new Tamagoyaki Pan & Spatula from Amazon. It had great reviews and the spatula intrigued me. I’ve had a cheap $1.99 pan that I either lost or threw away. I’ve also had an expensive $25 pan from Shirokiya that rusted on me because I had no idea I had to season it. It probably said to season it, but it was in Japanese. Ha! After that pan died I ended up just using regular skillets, which can get frustrating because you get left with flat tails at the end of your egg rolls that just seem wasteful. I finally tried it out last night and ho-ly crap I am in LOVE with this thing! It’s non-stick and by that I mean really non-stick. I forgot to put more oil the second rolling and it didn’t even matter. The pan is very deep, which really helps for making fat rolls. When I was done, it was a perfect rectangular roll cooked a nice, bright yellow on the outside. I could not freaking believe it, seriously. Of course, in my haste to cut it open and look at how the nori turned out, I forgot to take a picture. I’ll be sure to take one the next time I produce another miracle tamagoyaki. 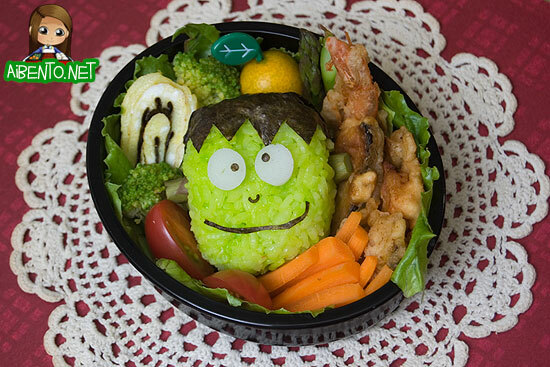 Here is Mr. Pikko’s bento, sans-cutesy Halloween stuff. 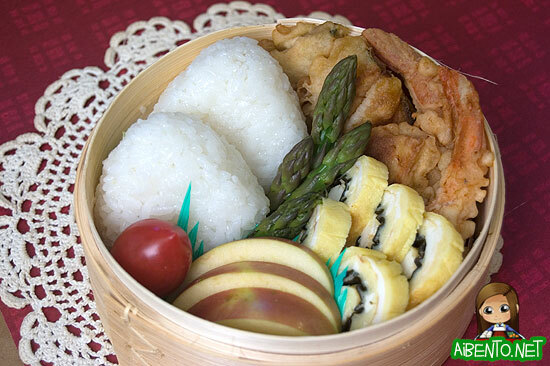 I put more tempura in it along with two musubi, asparagus, five slices of the nori tamagoyaki, fuji apple, and a baby roma tomato. He’s been overeating lately, so my bentos have been good portion control for him.